MOSCOW, January 26. /TASS/. Over 4 million ticket requests have been submitted both from domestic and international football fans since the second phase of ticket sales for the 2018 FIFA World Cup in Russia kicked off early last month, the FIFA said in its statement on Friday. According to the statement, "4,021,211 tickets have been requested since the start of the current sales period on 5 December 2017." "So far, most of the applications have come from Russia, with fans from Germany, Argentina, Mexico, Brazil, Peru, Poland, Spain, Colombia, USA and Netherlands representing the top ten countries from abroad," the statement said. "Overall, the international demand accounts for 45%"
The first period of the Phase 2 ticket sales was launched on December 5 and would last until January 31, 2018. 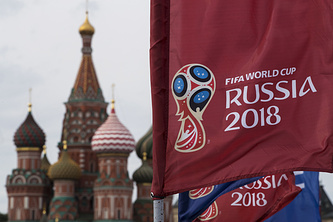 December 5 was also the date for the resumption of ticket sales in the Category 4, which was especially introduced by FIFA for this upcoming world football championship and is reserved exclusively for Russian residents. "Fans can apply for individual match tickets for all matches (except for the opening match and final) and venue-specific tickets for all stadiums, as well as supporter tickets and conditional supporter tickets for all 32 teams, which are only available in this sales period," the statement said. The second period of Phase 2 dubbed as the "First-come, first served" will open on March 13 and provide sales services until its closure on April 3. FIFA reported in early December that after both periods of Phase 1 of ticket sales a total of 742,760 tickets were allocated. Phase 3, dubbed as the "Last Minute Sales," will run from April 18 up until the final match day of the competition and the remaining tickets will be available for purchase on a first-come first-serve basis. Russia selected 11 host cities to be the venues for the matches of the 2018 World Cup and they are Moscow, St. Petersburg, Sochi, Kazan, Saransk, Kaliningrad, Volgograd, Rostov-on-Don, Nizhny Novgorod, Yekaterinburg and Samara. The matches of the 2018 World Cup will be held between June 14 and July 15 at 12 stadiums located in the 11 mentioned above cities across Russia. Two of the stadiums are located in the Russian capital.